Being webmaster of Antietam on the Web has its challenges, but big rewards, too. Once of the greatest is the steady stream of correspondence I get from people all over the world who have pieces of the puzzle to share. Just before stepping off the grid for vacation a couple of weeks back, I had a note from a delightful person in Arizona who’s family owns the painted portrait you see here. This noble warrior is Thomas Casimer Devin (1822 – 1878), here in the uniform of Major General: the (honorary) rank he attained by brevet in March 1965 and by appointment in the US Volunteers after the War was over. 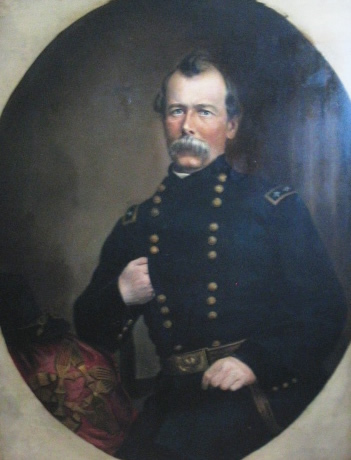 He was Colonel in command of the 6th New York Cavalry at the battle of Antietam in 1862, and led a detachment from his Regiment in that action, their first significant combat of the War. 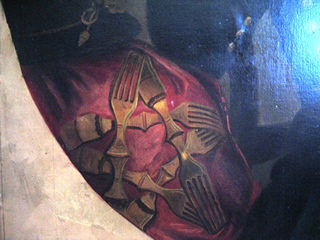 The 5 forks in the shape of a star were painted on a silk flag presented to Devin and his Division after the battle of Five Forks by Major General Philip Sheridan, his commanding officer at that action. It was exciting when I found the information about the flag online from the New York Times obituary of Gen. Devin. I wonder if the flag still exists somewhere. The other neat thing that is so wonderful is the color that brings this time period to life. Devin’s blue eyes make for a striking portrait. I imagine that Devin sat for the portrait shortly after the battle of Five Forks. He appears quite young at the time. I’m no art authority, so can’t help much with artist identification. Healy was certainly famous for this kind of portrait, and painted many. He was, in fact, America’s most prolific portrait artist. His of Abraham Lincoln are justifiably famous. I’m worried that some of Healy’s work is rather finer and more subtle that this Devin portrait, but he produced a range of image quality over his career including works very similar to this in style, so it seems possible it is his. If the artist is Healy, the work would likely have been painted between 1865 and 1869, after which time the artist left Chicago for 21 years in Europe — though he did return occasionally to complete commissions in the US during that period. There are many people more expert than I in cavalry operations, including at least three other bloggers, so I hope someone will weigh in with more on Devin and/or Five Forks. 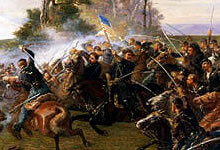 Briefly, the battle took place southwest of Petersburg, Virginia, on 1 April 1865. It was one of a series of actions–beginning at Quaker Road on 29 March–which forced General Lee to pull his Army out of fixed defensive positions around Richmond/Petersburg and begin the withdrawal which ended at Appomattox Courthouse 9 days later. At Five Forks General Devin was in command of a division of Cavalry–which may have fought dismounted–and is credited with turning the Confederate flank and breaking the battle open, or at least hastening it’s end. During the battle Sheridan himself took up a flag and led a charge that pierced the left of the Confederate line. 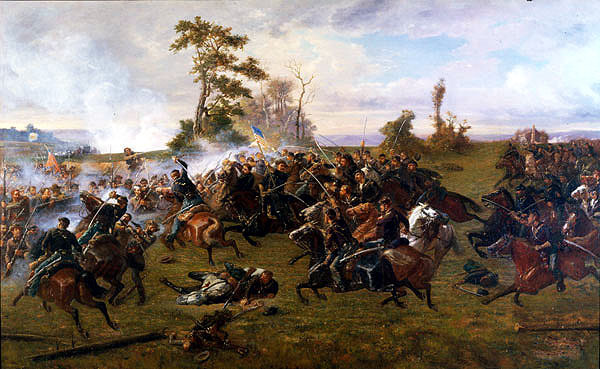 This scene has been depicted in art several times since, including the dramatic version by Paul D Philippoteaux, above [the artist is better known for the Gettysburg cyclorama]. The battle also produced some long-lived controversy, as Sheridan relieved his Infantry Corps commander, Major General Gouverneur K. Warren, for being late to the party. Warren’s promising career was thereby ruined, though he did eventually (1879) get a court of inquiry to clear him of some (all?) of the charges. The Five Forks battle site is now part of the Petersburg National Battlefield. I was completely blown away by this post and the oil painting, which was pointed out to me tonite by good friend Eric Wittenberg. That flag on Devin’s knee is indeed the one presented to Devin and his 1st Cavalry Division for their action at Five Forks – the image on the flag being quite a play on words through images. I know Devin descendants in Arizona and Colorado (Devin was in fact posted in those locations after the Civil War) but I was completely unaware of this painting. Devin was 45 years old at the end of the war, so if this were painted in the few years following until Healy (if he’s indeed the artist) went to Europe, the timing is right. Devin would have been 45-50. 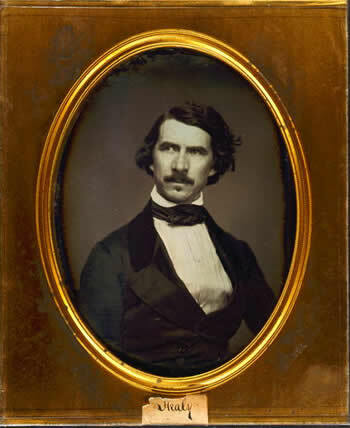 Devin died in 1878 as colonel of the 3rd US Cavalry. Many folks know that I portray Devin in living history, and even in one documentary film that was released a few years ago. I have always wanted to see an image of that Five Forks flag, because I’ve long wanted to reproduce it. I know nothing about whether it exists – I’ve been in contact with Devin’s gggnephew, who has Devin’s presentation saber and several other personal items, but not the flag. If it does exist, only Lord knows where it might be. Is there any way you can put me in contact with the owner? I’d enjoy sharing information with them. I’ve been collecting information about Devin for over 20 years, and have more “stuff” on him that anyone on the planet – so you can imagine that seeing this painting has been quite a moment for me. Thanks, Brian, and hope to hear from you. I’d also very much like to reproduce this image on my blog, as well as some more information about Devin, his service, Five Forks, and this flag. Maybe the owner will give me permission to do so. Wow! Very cool JD. I assumed you guys already knew about the painting. I’ve just sent you an email about contacting the owner. Just an update – I’ve been corresponding the last few days with the owner of the painting, and she generously gave me permission to reproduce some images of it on my blog. I’m going to do that this week, within a biographical post about Devin. She also gave permission to reproduce the painting in a future book – which I’m sure I’ll do. One day, Eric and I plan to do a work on the cavalry during the final days of the war (far beyond in detail what Longacre did a few years back) and this image couldn’t be more perfect for it. You’re certainly welcome, JD. Glad to hear of your success and pleased to be the connection here. Looking forward to your posting. I would like to inquire of the owner, if we could use the painting for a Civil War Trails Marker. The marker, if approved, would commemorate the winter encampment of the 6th NY Cavalry and others at Lovettsville, Va. in the winter of 1865. Gen. Devin was the commanding officer. On occasion I enjoy family research, and to my amazement I found your site. My grandmother, Frances Noonan Maher would be Thomas Devin’s grand-niece. Her grandfather was Thomas’s brother. We have a few photos in the family and copies requested Thomas’s letters that are in the National Archives. My entire family still have the ‘blue eyes’ btw. Even though we’re not in Brooklyn anymore, we’re all still in the tri-state area. Interestingly, I am a museum curator by profession, so it’s rather remarkable I’ve stumbled onto my own history for a change. I sit as a gubernatorial appointment to CT Civil War Commemoration Commission, so this has been a wonderful moment to honor my own family.